Many distributors have tried to address inventory management with business intelligence systems. Unfortunately, BI tools can only take you so far when it comes to implementing correct inventory practices. For example, you might have set up your BI system to give you feedback for particular customers buying specific items. Or you might apply certain measures across your thousands of customers to better understand general trends. These simple methods break down with your big accounts. When you land or lose a large customer or even just a single large project, you can experience large-ranging ripples in your inventory control unless you have the right tools for operations planning. Distributors rely on their ERP systems to monitor inventory levels, sales and demand trends and help guide buyers toward correct replenishment decisions. But large customers and projects skew those measures. Your ERP system only looks backward, using a moving average to build out a trend. The assumption made by your ERP system is that your new level of demand is the real status quo. If that demand was triggered by a single project or from a large customer that you’ve lost, it could take months for the ERP’s moving average to reflect those changes. Bad assumptions lead to bad purchasing decisions. If you buyers are fed with incorrect demand patterns, they will either be left with out-of-stocks when a big customer starts buying up your inventory or they will buy too much after a big customer leaves. You sales reps are not always eager to admit that they lost a large customer. In some cases, it might be months before your buyers change their buying habits after a large customer leaves, leading to high over stocks. 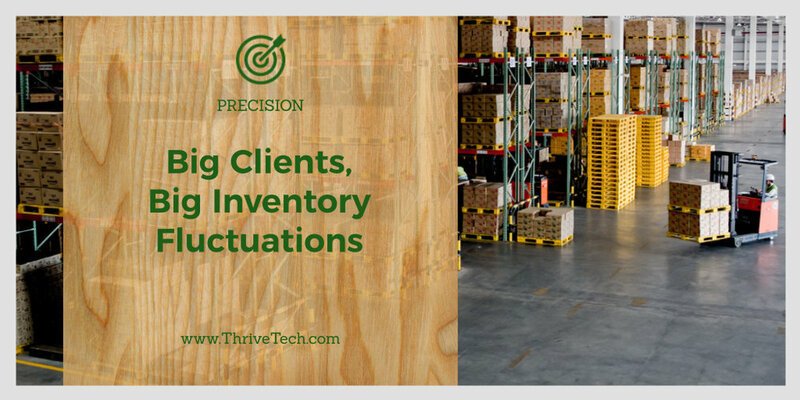 Distributors using Thrive's Closed Loop Inventory ManagementTM are much better prepared to deal with inventory fluctuations caused by large customers and large projects. Thrive analyzes your sales transactions by item by location so it can alert your buyers when there is significant customer activity. Then, Thrive’s forecasting can react and adjust the forecast to account for a new customer acquisition or a customer lost. That way, while your sales rep is still out trying to win back that large customers, you buyers are prepared to respond either direction. If your sales reps are good at communicating changes to your buyers about key account information, your buyers can use that information inside of Thrive. For example, if a sales rep communicates that a large account will be dropping a particular item on a particular date, your buyers can enter those dates into Thrive. Thrive will then remove the demand for that customer out of your system and your purchasing decisions will continue to be highly accurate despite the fluctuation in sales.